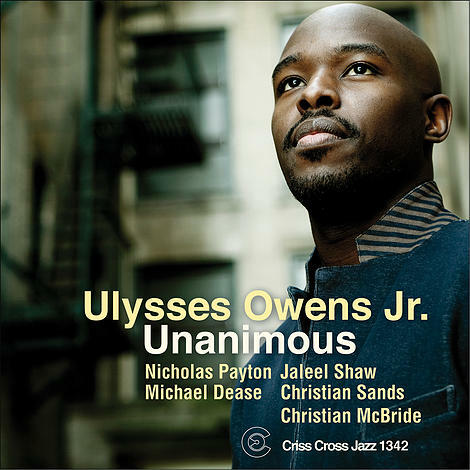 Still on the shy side of 30, Ulysses Owens Jr. has garnered an international reputation as drummer of choice for Christian McBride, Nicholas Payton, and Kurt Elling, three very different personalities who are very particular in what they want to hear from the kit. 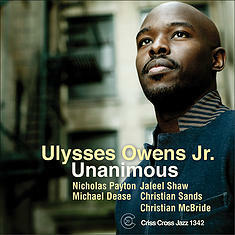 On his Criss Cross leader debut, Owens Jr. convenes Christian McBride and Nicholas Payton, as well as pianist Christian Sands (even more visible for his work in McBride's trio), rising star alto saxophonist Jaleel Shaw (Roy Haynes' main sax voice for the last five years), and trombonist Mike Dease. The leader finds fresh approaches to various flavors of the swing timeline --- Art Blakey and the refractions of Buhaina established by Mulgrew Miller and Bobby Watson (each a one-time employer); Tony Williams' two phases with the Miles Davis Quintet; Ed Thigpen's crispness with the Oscar Peterson Trio --- within a 21st century context.